I had you at Pinterest didn't I? Well, we are going to also throw in Michaels and Hometalk for an even better pitch! Okay, I know most everyone has heard of Michaels and Pinterest but if you haven't heard of Hometalk, then you are in for a treat. Hometalk is the largest home & garden knowledge hub on the web. It's fueled by the firsthand experience & advice of hundreds of thousands of home enthusiasts and professionals. And on February 16th, I will be the Featured Hometalk Blogger at the Pinterest Party at my local Michaels (McKnight road for you Burgh folks). 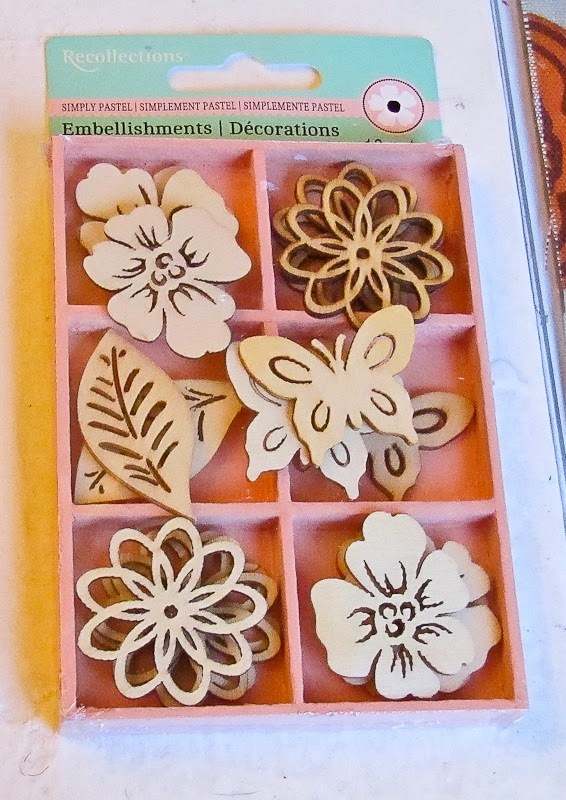 All Michaels will be having Pinterest Parties on that day but click here to see if there will be a Hometalk Blogger at your local Michaels. So at the event, we will be creating some Pinteresting artwork! This goes together in about 45 minutes minus drying for the paint. 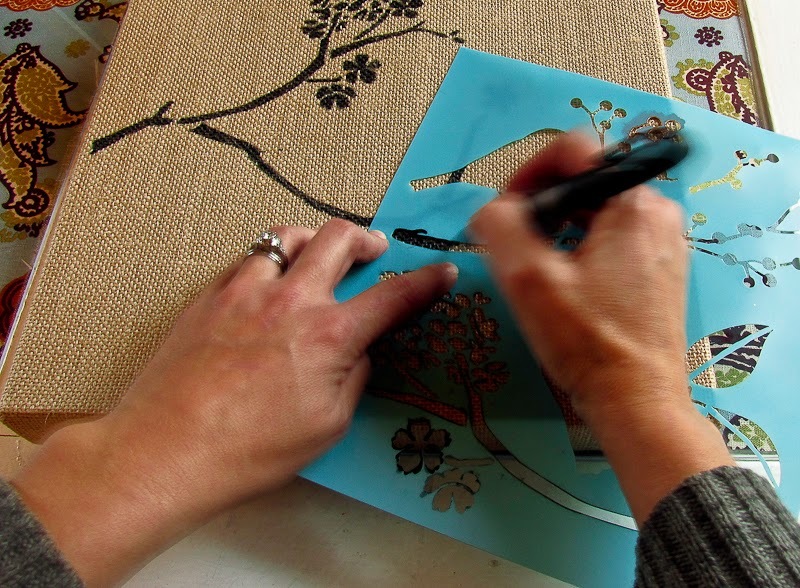 First take your stencil and your sharpie and start drawing! 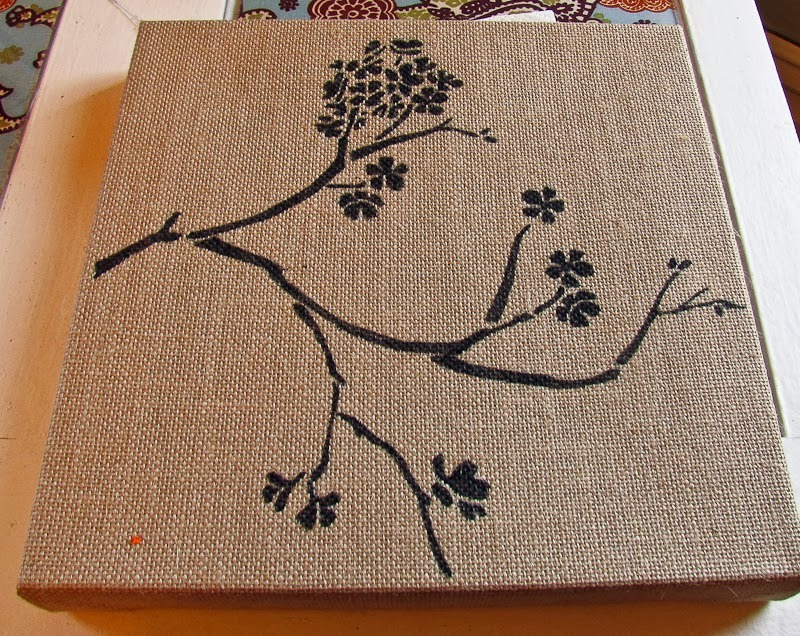 I just used my stencil as a guide and made the branches of my cherry blossom tree go where I wanted them to go. With a sharpie it is much quicker and easier to do this. See! 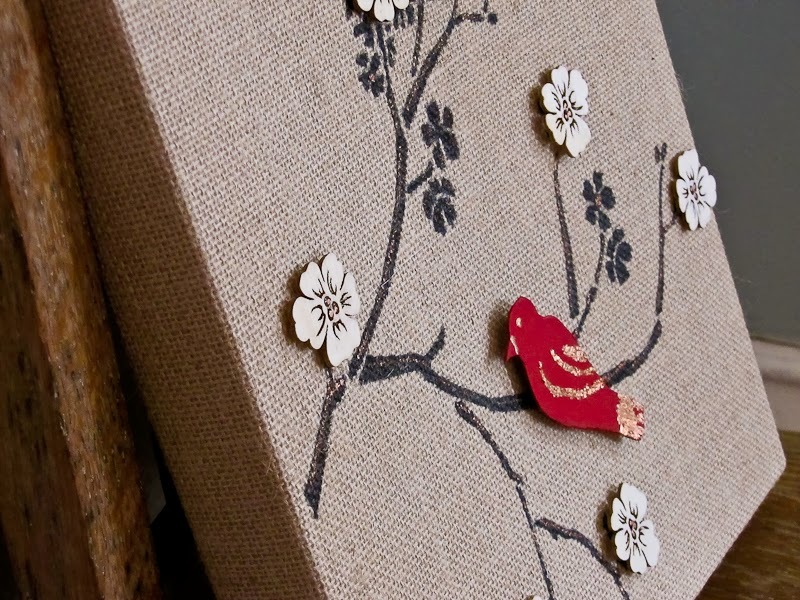 Already ready for your next step…..
Take your wood embellishments and add a dot of copper leafing to the inside and set aside. 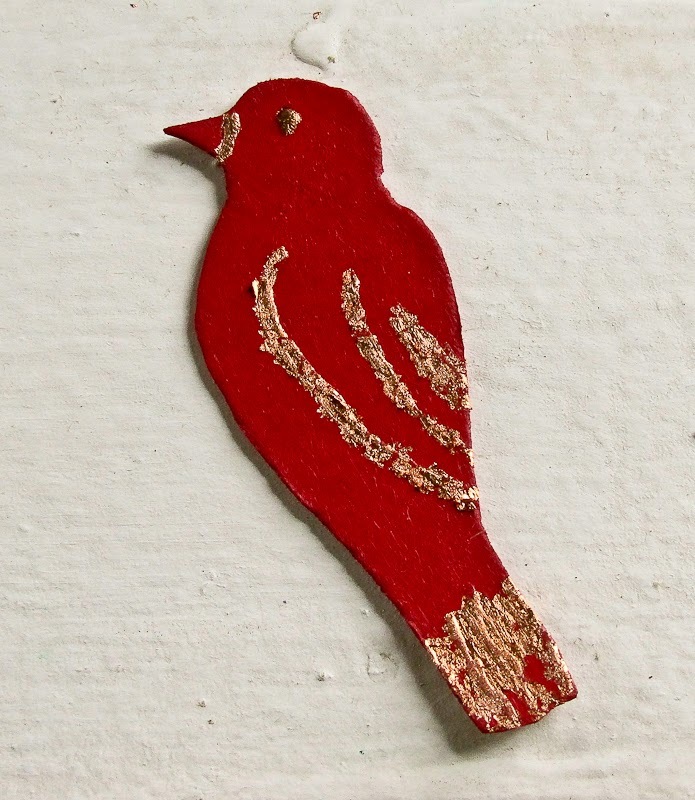 I did not like the wood birds that were available so I made my own at home using cardboard and the bird stencil. Just cut out of cardboard and sand the edges with 320 grit sand paper and then painted with whole thing with the brush on copper leafing. 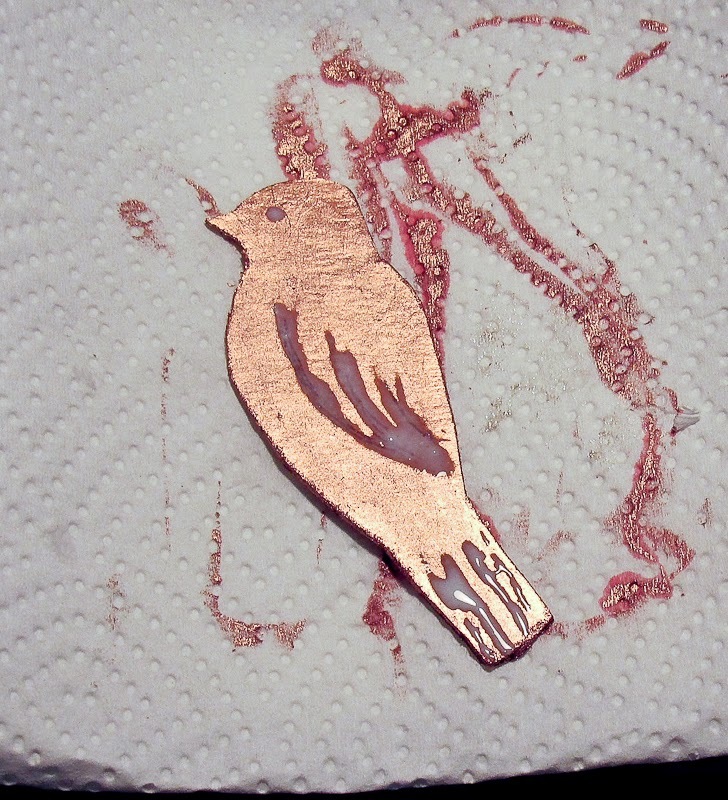 Once dry, I wanted ti to have dimension, so I painted sizing where I wanted my copper leaf to go and let that dry. 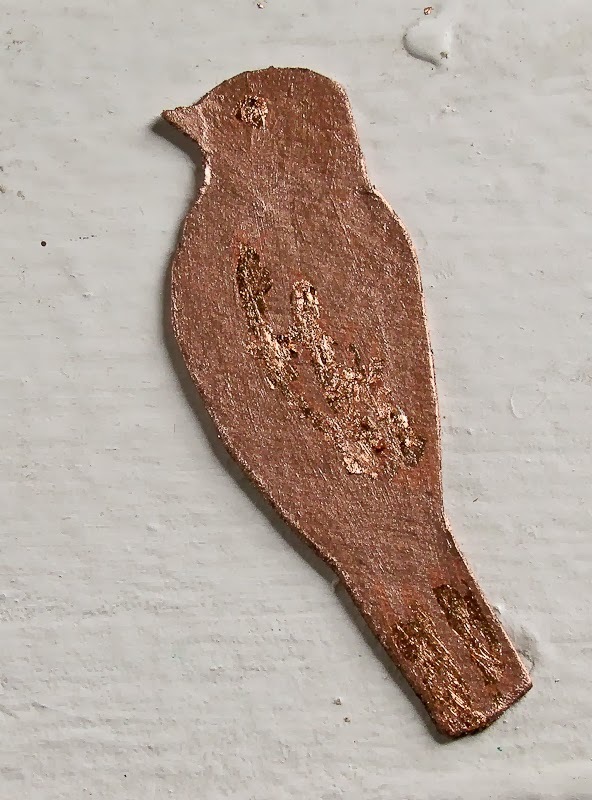 Once dry I added my copper leaf details. You can then brush on some copper highlights on the branches as well to give your tree some depth. 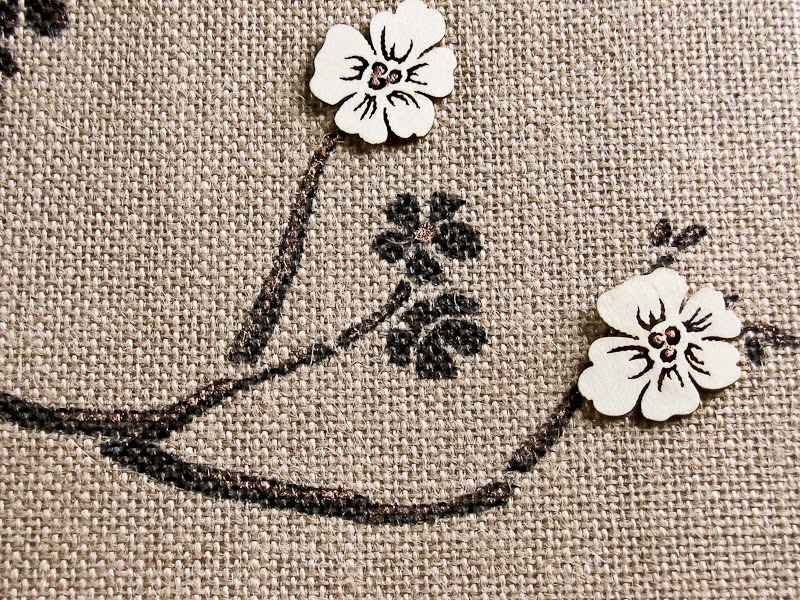 Once you are ready to hot glue your flowers on, you are going to glue some straight onto the burlap and others you are going to raise up by first adding a dot of hot glue to the burlap and letting it dry. 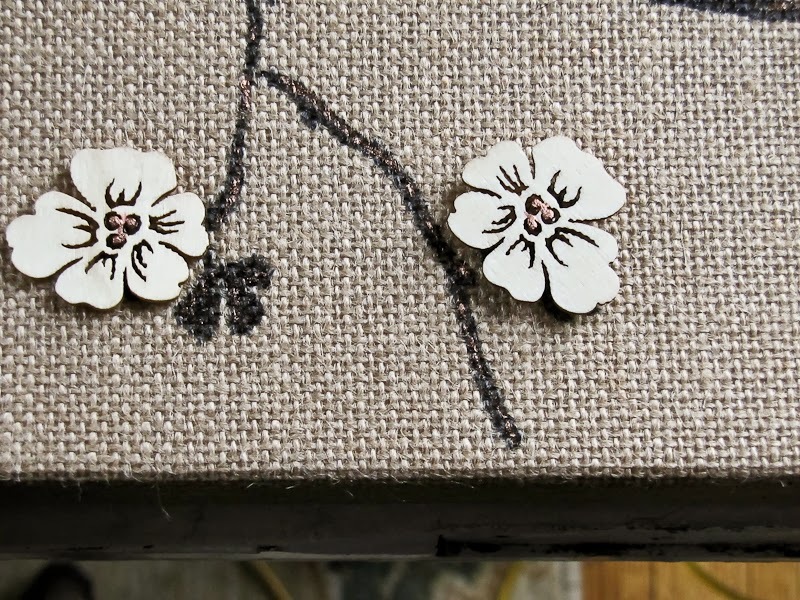 Then add another dot of glue on top and attach your flower. Now you have dimension! You'll do the same thing when you attach your bird. So here is your finished product. 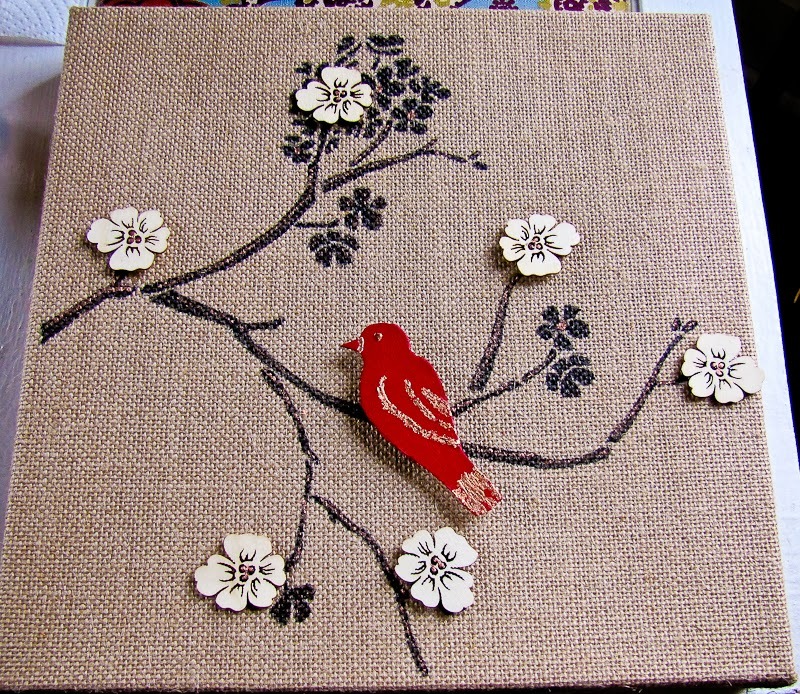 I did like the monochromatic look of this but felt like it needed some punch so I made a red bird with copper leafing. Here you can see the how the dimensions helps it not look so flat. 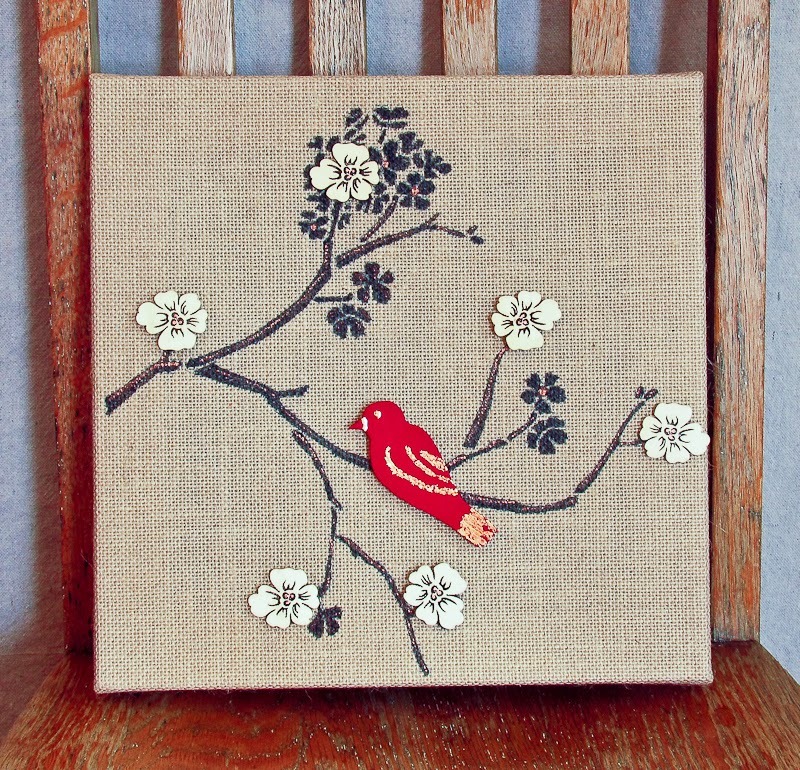 So now you can create some Asian inspired artwork on your own or join me at Michaels on Feb. 16th to see my second version of this little burlap beauty. Check out the Michaels Pinterest displays in stores for more inspiration! The first 24 people attendees on February 16th will receive these chalkboard cards for FREE! Check them out HERE! 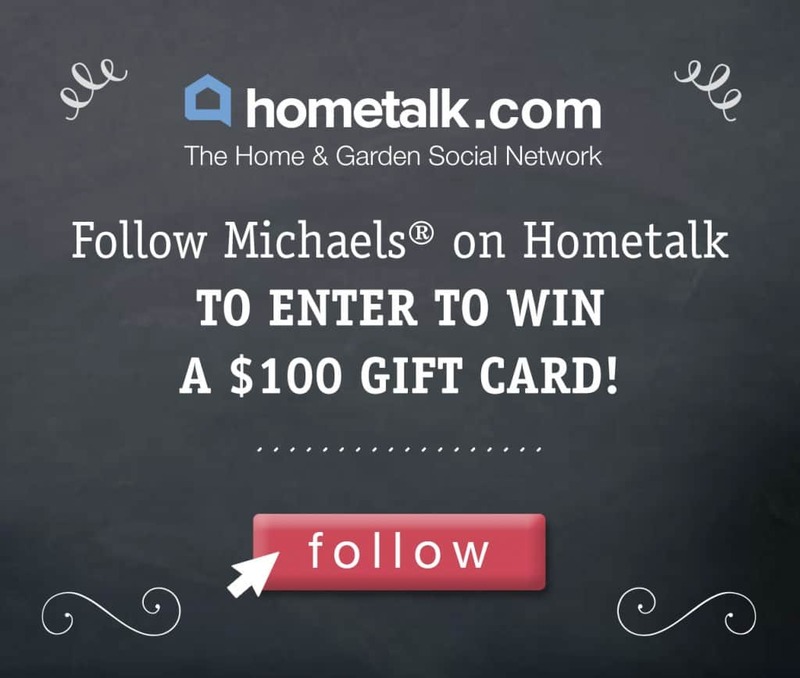 Follow Michaels on Hometalk to enter to win a $100 Michaels gift card. Five winners will be announced on Hometalk’s FB page on Feb 17, after the in store party! I will have some freebies to give away as well! You all inspire me everyday with your kinds words left in comments and fun emails to touch base so I really hope to see you if you are in the Pittsburgh area. This is going to be a really fun event and the best part is that I get to meet YOU! In person! How great is that? Disclosure: This post is part of a sponsored partnership with Hometalk. 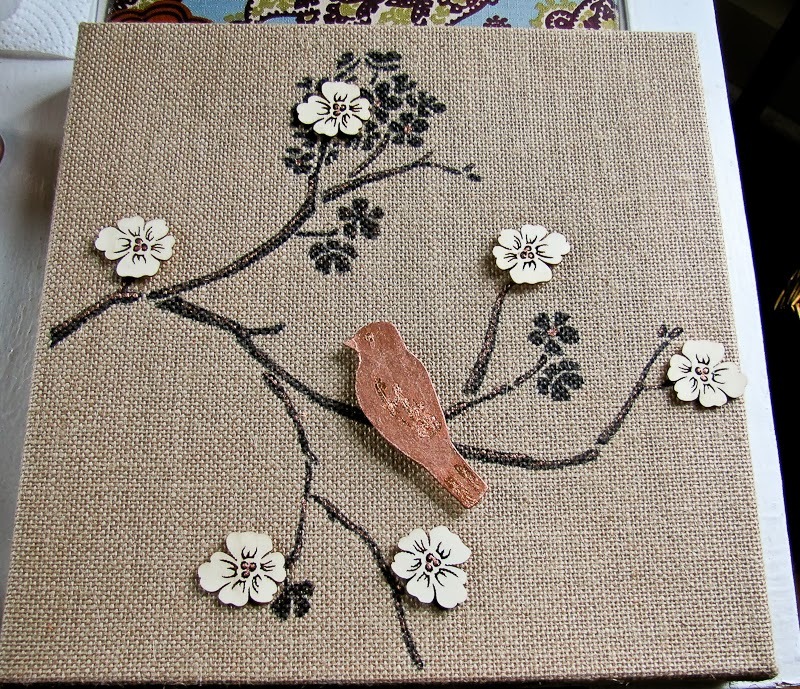 But the tutorial, ideas, opinions and asian inspired burlap canvas are 100% my own!